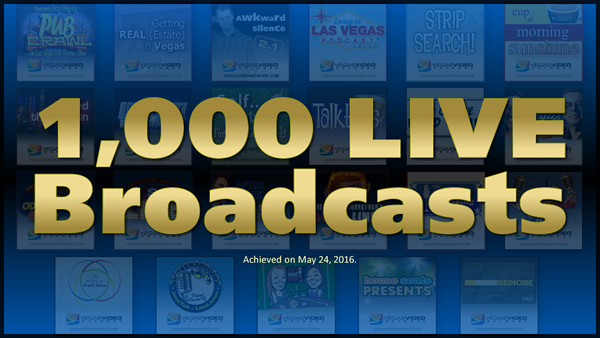 LAS VEGAS, NEVADA – May 25, 2016 — The VEGAS VIDEO NETWORK®, the first and most respected live online broadcasting network in Las Vegas, today announced it has produced ONE THOUSAND (1,000) LIVE, multi-camera broadcasts. Theses live broadcasts have been viewed 427,000 times by a world-wide audience which includes 150 countries and all 50 states. The network accomplished this milestone by way of 20+ highly curated shows with themes including lifestyle, food, sports, comedy, entertainment, advice, and business. Shortly after each live broadcast is completed, the episode is made available on-demand in both audio and video formats. As a result, the network has produced 2,000 podcast episodes. Accordingly, PodWorx, Inc., the parent company of the Vegas Video Network, is Nevada’s most experienced live streaming broadcaster and podcast producer. The Vegas Video Network YouTube channel has delivered 1,010,600+ video views. This is significant given the length of VVN videos, which are typically no less than 30 minutes long. The network’s Roku channel has over 72,000 subscribers. The Vegas Video Network website has an average of 73,200 website visits per month. The VEGAS VIDEO NETWORK live streaming page can be found at http://VegasVideoNetwork.com/LIVE. The VEGAS VIDEO NETWORK® is the first and most respected online broadcasting network which specializes in insider news and expert views from Las Vegas locals to our neighbors and the world. We develop and produce all-original programming that is predicated on input and participation from our fan base. We are especially close to our worldwide audience because we focus on two key principles — approachability and authenticity. The VEGAS VIDEO NETWORK is a YouTube Partner, available on iTunes, Roku, Livestream, Stitcher, Tunein, Google TV, Apple TV, Google Play, Facebook, and Twitter. The network is owned and operated by PodWorx, Inc., an Internet broadcasting company that specializes in podcasts, Web TV, and live streaming video productions. Congratulations Scott on your 1000 Video Milestone!! !